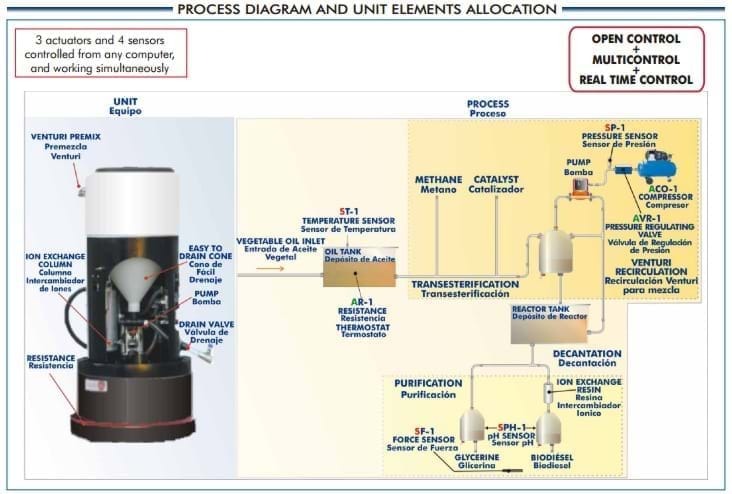 The Computer Controlled Biodiesel Process Unit (EBDC), developed by EDIBON, is a unit which allows the study of the biodiesel production cycle different stages. Different parameters that affect the whole process, as well as the obtained biodiesel quality, may also be studied. The EBDC unit generates 50 litres of high quality biodiesel in 24 hours. The "ingredients" required for its generation are 50 litres of raw or used oil, 8 litres of methanol and a catalyst (liquid methylate is recommended). During the process, these substances are heated, mixed, separated and purified. The chemical reaction to make biodiesel is quite simple. Vegetable oil is a "triglyceride", in other words, there are three hydrocarbon chains at the same glycerin molecule. A certain amount of catalyst is needed to break those hydrocarbon chains. A chemical test, called titration, is needed to determine the amount of catalyst required to compensate the acidity excess in waste vegetable oils as a result of cooking. The accessories needed to carry out the test are supplied with the unit: pipettes, droppers, titrant, etc. The catalyst is dissolved in methyl alcohol (methanol). This "premixture" is stirred strongly with the oil to enable a complete oil conversion. The mixture makes the catalyst break each hydrocarbon chain one by one, bonding it to a floating molecule of methanol afterwards to form biodiesel. Molecules without glycerin drop to the bottom of the reaction tank, where they are eliminated. The unit uses an external heater with safety thermostat. It is controlled through the software (PID control). It includes a pump which works with air (supplied by a compressor). This pump transfers the oil towards the reaction tank, homogenizes it, mixes the oil with the premix and mixes the oil batch in swirls. It also operates the Amberlite resin column and supplies the biodiesel to the vehicle or storage tank. Glycerin obtained in the process is extracted through the drain valve located at the front of the unit. After removing the glycerin, a resin ion exchange integrated column facilitates the biodiesel purification process. Through a slow recirculation, this column removes soaps, glycerin and methanol excess, generating an excellent clean fuel. As long as the raw material is appropriate, the product will fulfil all the required standards for biodiesel. Besides, the unit has two pumps, one for methanol and the other for the catalyst. They are manual pumps specially devised to be used with solvents, including alcohol. - Know the vegetable oil preheating temperature and control it through a PID control. pressure sensor. Agitation and recirculation levels will depend on this inlet pressure. - Know the obtained amount (weight and volume) of biodiesel, and by-products such as glycerin, by means of a load cell. - Know the biodiesel pH in order to ascertain its quality. This Computer Controlled Unit is supplied with the EDIBON Computer Control System (SCADA), and includes: The unit itself + a Control Interface Box + a Data Acquisition Board + Computer Control and Data Acquisition Software Packages, for controlling the process and all parameters involved in the process. guarantees a good stability and resistance. Main metallic elements in stainless steel. elements in the real unit. Wheels that facilitate the unit's mobility. Reactor tank with inner tap (75 litres). Oil heating tank (65 litres). Heating band computer controlled, of 1.5 kW for the tank. Premix bottle with couplings and hoses. pump is operated by a compressor. 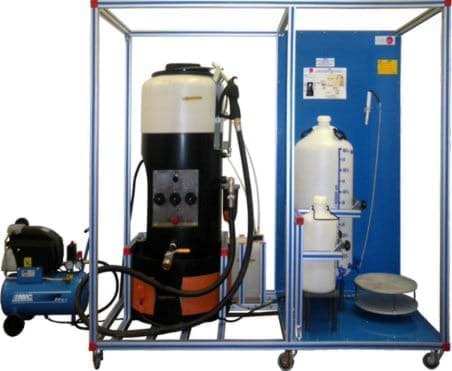 recirculation system for the premixing process. Amberlite (ion exchange resin column). Plastic funnel with mesh for particles. Polyethylene graduated biodiesel jerry can of 60 litres with dispenser tap. Polyethylene graduated glycerin can of 10 litres with dispenser tap. Pressure regulating valve, range: 0-6 bar. Pressure sensor, range: 0-6 bar. Force sensor to measure the obtained glycerin and biodiesel weight, range: 0-75 kg. pH sensor to determine the quality of the obtained biodiesel, range: 0-14 pH. 2 droppers of 5 ml. Pipette of 10 ml with manual pump. Batch of 50 l. of biodiesel every 24 hours. 50 l. of raw of used oil. 8 l. of methanol, and catalyst. Advanced Real Time SCADA and PID Control. Open Control + Multicontrol + Real Time Control. Own Control Software based on Labview. National Instruments Data Acquisition board (250 KS/s (kilo samples per second)). Students multipost (an entire class) by using a projector. Ready for doing applied research, real industrial simulation, training courses possibilities, etc. Unit is totally safe (Mechanical, Electronic/Electrical and Software safety devices included). Results calculation and analysis software (CAL). Designed and manufactured under several quality standards.